SachaOmega® is produced from the highest grade organic, cold-pressed extra virgin Sacha Inchi Oil. This oil contains the highest content of unsaturated fatty acids on the market, with 92% composition of Omega fatty acids 3, 6 and 9. Nutritional Supplement: Due to the high content of Omega fatty acids, SachaOmega® is the perfect supplement for people whose diet does not include fish or Omega-rich vegetables in large enough quantities. We supply SachaOmega® bulk or in high quality vegetarian gel capsules. Food: SachaOmega® is delicious sprinkled on salads or cooked vegetables due to its pleasant, slightly nutty flavor. Sacha Inchi Oil won the Médaille d’or (Gold Medal) at the AVPA Specialty Foods Commodities competition in Paris in 2007. Additionally, it can be used as an ingredient for the preparation of different blends. In order to preserve the Omega 3 content of SachaOmega®, it is necessary to work with low temperatures. For this reason, SachaOmega® is not recommended for cooking. Cosmetics: SachaOmega® will act as a binding medium and as a lathering agent for soap. It also has a nutritional effect on the skin, and helps make hair soft and glossy. As a topical moisturizer, Sacha Inchi Oil has been used since ancient times for nourishing hair, skin and nails by strengthening the natural barriers of cell walls. SachaOmega® can be combined with other ingredients when development new products, enriching them with high Omega content while simultaneously increasing their retail value. 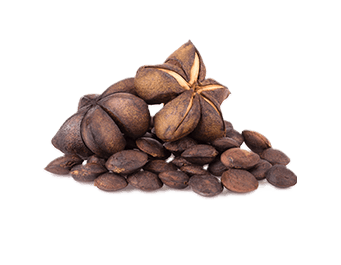 Sacha Inchi seeds are among the best plant sources for Omega-3, Omega-6, and Omega-9 essential fatty acids. In addition, Sacha Inchi is high in protein, iodine and the antioxidant vitamins A and E. It is also full of essential and non-essential amino acids, and has only 6% saturated fatty acids compared to its 90-93% unsaturated fatty acids. While Omega 3 and Omega 6 may be obtained from other vegetable sources, they do not provide a ratio of Omega 6 to Omega 3 in the range of 1:1 to 3:1, which science concludes is necessary for a healthy life. Since SachaOmega® has a ratio of 1:1.4, one of its principal benefits is to correct the imbalance between Omega 3 and Omega 6 that exists in most modern diets, which may contribute to poor health. The high content of unsaturated fatty acids in SachaOmega® (92% Omega 3, 6 and 9) promotes good health. Omega 3 and Omega 6 are two families of essential fatty acids (EFAs). EFAs are long-chain, polyunsaturated fatty acids derived from linolenic and linoleic acids. They cannot be created in the human body and must be obtained through foods. Omega 3s are used in the formation of cell walls, making them supple and flexible, and improving circulation and oxygen uptake with proper red blood cell flexibility and function. Omega 6s can help promote normal blood sugar levels and healthy skin. Our body requires an ideal balance between Omega 3 and 6 to maintain its correct functioning. 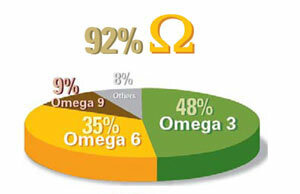 SachaOmega® offers this ideal balance between Omega 3 and 6. Sacha Inchi Oil is an extra virgin oil whose content of polyunsaturated essential fatty acids (PUFA) surpasses 83% , of which the linolenic acid (an Omega 3 fatty acid) totals 48% while the linoleic acid (an Omega 6 fatty acid) totals 35%. Sacha Inchi oil has a light taste, similar to the freshly crushed seeds of the Sacha Inchi plant, and compares extremely well to other vegetable oils with stronger taste – for example, olive oil. Our process produces a premium quality, organic oil. To attain this, our seeds are cold-pressed in stainless steel machinery , avoiding harmful effects due to reactive metals.